Wildlife keeps many secrets, secrets that would astound anyone that happens to spy on their most intimate secrets, and camels are willing to die as long as theirs does not come to light. At the dawn of life, both Dromedary and Bactrian camel wore on their back a single hump, and fiercely guarded, because in the driest of deserts, the hump ensures they could survive long without food or water. “I need to urgently update the Evolution Plans for Wild Fauna and this requires stakeholders to participate in an experiment: you must traverse the drylands of the world and see in what place can best adapt”. – Will be an honor and pleasure to serve your ladyship! Nature was all fluffed. What a gentleman could be the Bactrian camel! She gave the camelids the roadmap wishing them good luck and left. – Traverse the deserts, such a nonsense. Of course, it happens when usual bootlicking say she’s right in everything! The lama and the alpaca, which had other concerns, did not understand the dromedary’s anger, so they continued their lunch. The Bactrian camel, sad and offended, not speak to him. 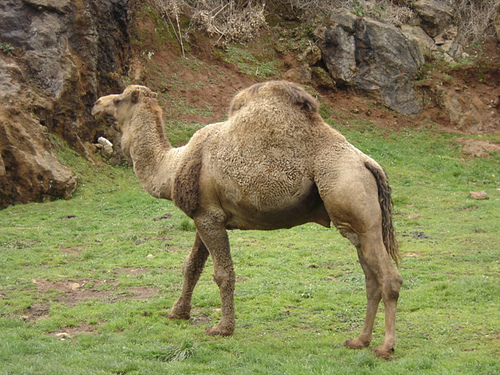 Reluctantly, the dromedary took the path followed closely by the Bactrian camel. The lama and the alpaca, which had not finished eating, swallowed the last hurried bites and ran after them when they realized they were running alone and had forgotten the way home. They walked, walked and walked, crossing the deserts of the world. One day, they met a Desert Rat who, with their young, were dying of thirst. – Help us, please, we die of hunger and thirst! “Climb on my back and I will take you to the nearest well”. The Rat and their pups mounted on its back. When they reached the spring water they drank till their bellies were round, and when the others would leave, decided to live there. The Rat gave them very grateful goodbye and when away from the dunes, the Bactrian camel could see his figure and his mice still waving his front paws. Camelids continued their journey and somewhere in the Andean highlands, lost sight of the Alpaca and the lama, who refused to step over because they were so tired. Although they were ignorant, they had crossed over half the world and came closer to their homelands. The dromedary was starting to feel familiar smells and was anxious to leave the hard mission. The Bactrian Camel, however, knew he must return home, between the Hindu Kush and the Amu Darya, as he had promised to Nature. Walking through the deserts of North Africa, the dromedary felt in the distance the sea salt scent, and losing his mind, started to jog and then run to the coast. The Bactrian camel shook his head sadly before resuming the route. Now he had been left completely alone. But then, the Nature appeared suddenly, stopping the run of the dromedary. – Where are you going in such haste without finishing your homework? – the Nature snapped. The dromedary lowered his head in shame and remained unanswered for so long that the Bactrian camel arrived by their side. “How is your ladyship, what a pleasure to see you,” he greeted. “The lama and the alpaca have found their destination in the Andes and apparently, you also envision your own, she said, but not all of you have met the same way, so, you dromedary, you will be living in the Arabian desert with difficulty and join your energies on the hump. You instead-she was addressing the Bactrian camel now-, receive greetings from the Desert Rat, she and her pups are very thankful to you. You can return to Bactria, from now on you’ll have double reserve of energies. So saying, she disappeared. After a while the Camel looked up and discovered with astonishment that the Bactrian camel, instead of one, now had two humps. Dying of envy, he resumed his way to the oasis of the coast and when asked why, unlike his cousin, has a single hump, gritting his teeth, lowered his head and stay in silent embarrassment. This story is so very old that the only witnesses are dust and ashes long ago. In those days, the first men that walked upright shared the Okavango, and, as they were new to the area, seeing a cheetah trapping a prey was a wonderful show to them. The Cheetah were then much more robust than today, they had the classic belly of the big cat and he was so much alike their cousins the leopards, which was very easy to mix up, but man, that young and strange animal, for some reason, he preferred them . 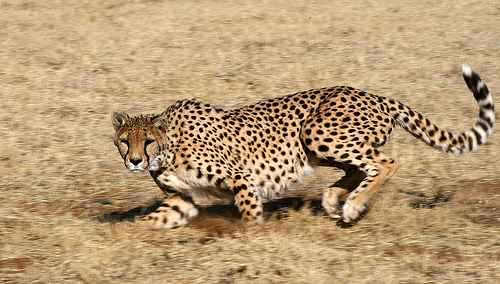 – What a beautiful race you’ve done, Cheetah, you certainly deserve to enjoy that delicious gazelle! Cheetah was a little confused. What did the newcomer say? Cheetah had done nothing that leopards, lions and hyenas do not do every day: get their food. “It’s nothing,” growled Cheetah, just hungry. – Nothing! But if you ran like the wind! – the man flattered him. Cheetah was very satisfied and that night when the herd was about to sleep, he told the story in detail. “Do you know, Lion, that man has made it clear that no one runs after a prey so beautifully like us”. And as animal love gossips, in a week or so , everyone around the Okavango knew that only cheetah run like the wind to catch their prey. The competition was unleashed. There was’nt a large cat that did not take his mornings to practice to the long runs and afternoon naps were abandoned as everyone strove to be the best runner. However, there was no consensus. The leopards were convinced of being the best, the cheetah had in his favor with the testimony of men, but the Lions claimed to be the best and who could be so foolish to oppose them? Perhaps the lions were not good runners, but could anyone doubt about how powerful were its claws and jaws? So they turned to be simple. “We will ask the man who decides – agreed feline families. “You are all good hunters. The lion is the most powerful, the leopard is the best climber, but surely only the cheetah runs like the wind. The war was declared. Leopards failed to greet his cousins and lions immediately granted them the dubious honor of leading the pack of their favorite prey. Now the cheetah not only needed to run to catch their prey, but mainly for his life from the fury of the lion. “Maybe I could teach you some things”. As soon as they demanded her advice, as The Nature made them a list of exercises needed to lengthen legs and tails, a diet to lose weight and a piece of advise that nobody asked. -Concentrate on short distances. With those legs, you would be good sprinters. The cheetah understood little or nothing, but truth was that they were hungry and were tired of living besides hiding from lions. That morning began their workouts and lowered the amount of calories consumed daily. Soon they had their stomach removed and had long, powerful legs. From running, their backs had become a striking curved and the tail had developed long and powerful and served them as a stabilizing rudder in the race. When the cheetah felt sure of winning any competition, sent an emissary to challenge the lions and leopards. -We will compete in the savanna, the first to catch an antelope is the winner, agreed to the cats. And they asked the man to be judge of the competition. On the very day, the leopard spent much of the day trying to catch an old wildebeest, until he finally gave up and climbed the nearest acacia to watch the developments. The lion lay down to nap, but not before ordering the lionesses of his pack to take charge of dinner. Females planned an ambush and caught a big buffalo on which they toiled until he had left but bones picked clean. Man was boring. What a waste of time! “This was the least competitive I have ever seen!” he said. He was about to return to the village when Cheetah came in. He was thin and their large padded paws were gliding over the grass like velvet. “Wait, man, – he said, you owe me your opinion”. He sat at short distance until he saw a herd of Grant gazelles to come closer. Cheetah stood against the wind not to be sniffed and fixed his eyes on an anaware, careless gazelle in there, boasting of being a good catch. Suddenly he lunged forward and ran like a cloudscape towards its goal. The gazelle flew like a shadow, but the distance shortened untill soon there was no way to avoid the meeting. A single blow and dinner was ready. Man, admired, came over to where the Cheetah share his food with the rest of the family. Cautiously, he stayed at a safe distance and then said. “Don’t know what you’ve done Cheetah, but now that your belly is gone, and your legs are longer, now you run like the wind and nobody can reach you”. The Cheetah reported throughout the Okavango the words of man, but they were very careful not to say that they were specialized in short races for the lion thought he could never catch them. So when after his run he’s out of breath on the grass, hiding so no one knows, he only reappears when he is able to breathe again. A long, long time ago, when hunting in the mountains, the first Emperor of China discovered the place was the homeland of enormous black and white bears, and contrary to the popular belief around the world he considered it the most beautiful animal ever. So astonished he was that the Emperor built a splendid palace in the mountains not to lose a day in the life of pandas. Gradually he began to make friends with them. He went for walks in the woods, let them fruits and vegetables, issued and edict banning hunting and assuring their protection, he kept the Imperial Guard for their safety and watched them daily. As he walked around in the cold season, the Emperor realized that their beloved pandas lacked sufficient food, so he sent for his star cook from Beijing and bestowed him the title of Chef of the Celestial Empire Pandas. After much testing, the cook of the Empire came to the conclusion that the best thing for pandas was eating chopsuei everyday and cooked in the large woks of the Palace vegetable chopsuei and then distributed it in the forest to pandas fed at home. The Emperor was so happy to see them satisfied so he wanted to eat the same and sat on silk cushions to eat with his ivory chopsticks this newly chopsuei served in his golden bowl. But his majesty became a little bored of this vegetarian chopsuei. He had sacrificed shrimps, chiken and pork so he wanted a small change and the Chef of the Celestial Empire added to chopsuei delicious bamboo shoots. At the very moment that pandas tried and eat bamboo, they began to dig into the dishes to choose from the outbreaks. They even started some fights because no panda wanted to share. The following days were a mess. Panda bears spent lunch time by throwing chopsuei to other pandas head for the last bamboo shoot and lost lots of food while they were hungry and grumpy. The Emperor, a wise man, decided that to fix the problem chopsuei will include fifty percent of bamboo shoots and he announced that he would help serve the new food to pandas himself. The Emperor of the Celestial Empire came in in his silk robe embroidered in gold thread and behind him came the Chef of the Celestial Empire in a rare gesture of deference to the most beautiful animal ever existed. But pandas were outraged. How could those delicious bamboo shoots had been contaminated with carrots, onions, mushrooms and worse of all, cauliflowers! Just finishing bamboo shoots they began to throw the chopsuei to everyone’s head and one of them had the brilliant idea of turning the wok over the head of his Imperial Majesty. The Emperor was furious, dripping soy sauce and chopped vegetables climbed into his car and inmediately ordered to return to Beijing. Never again wanted to hear about pandas. The palace of the mountains was demolished to the last part and each one of the bricks used in its construction was moved to Shanghai where it was sayed the Great Sea Serpent had recently been seen. His Majesty wanted to check with their own eyes and when he came to settle in his new palace by the sea the Imperial Sampan was already waiting for him. The pandas, discredited, were forgotten. That winter pandas were so hungry they were seen licking the dishes where the chef used to serve chopsuei in the good old times. Finally, one of them, in dispair, climbed a tree to see if the lunch was coming on the road. Just get up, he discovered some little green leaves that seemed atractive, he tried and tested and soon all pandas were eating as much bamboo as they could. Thanks to this diet, three thousands years later they were on the brink of extinction, but a careful chinese work sponsored by the government has set out to reverse the situation. Sometimes a silly panda has the idea of demanding a bowl of chopsuei, but not enough to open his mouth when his colleagues have pulled a clump of bamboo on his head.